Augmented Reality (AR) has received a lot of attention in the media recently, particularly in relation to what it can do for the banking sector. While AR may not be adopted by the mainstream today, the development of new modes could change this. The majority of people are unaware of AR technology but the rapid growth in popularity of Pokémon Go shows how fast AR can take off; walk down any street and the chances are you’ll bump into someone hunting down their next Charmander. AR technology’s future is far from confined to the gaming world. Apple has recently filed a patent for "enhanced face detection using depth information" which could be used for augmented reality. 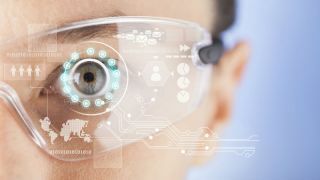 This follows several recent AR-related acquisitions by Apple; a 3D sensing company based in Tel Aviv, a German company that develops software allowing users to look at products and apply different colours and finishes to them and a cyber-security and facial recognition company. We may soon be taking 3D photos with an upcoming iPhone model – which would very quickly create a 3D map of our lives which could be used to develop more effective augmented reality. With these new patents and technologies emerging, companies are already looking to see how they can implement them. The financial services sector, which has taken great steps to digitise itself in recent years, is well positioned to make the most of AR. How can banks use AR? AR is already making waves in the banking sector. Several banks have already introduced AR mobile apps. The Commonwealth Bank of Australia and Halifax in the UK offer ‘home finder’ apps which use AR technology to enable users to view and pull up data on houses for sale as they pass them. Financial software vendor, Misys, developed a proof of concept augmented reality enabled personal financial management app. And Privatbank in Ukraine created a fascinating proof of concept which showed how AR banking could seamlessly merge into a customer’s day to day life. In emerging markets, banks like the National Bank of Oman use AR to allow customers to find their nearest branch or ATM as well as locate offers and deals when walking into a shopping mall or down the street anywhere in Oman. These initial steps in AR are interesting, but just hint at what the near future promises, what lies ahead could be transformational. Within a bank, AR has the potential to transform productivity. Data visualisation is a key tool for traders needing to make important data-driven decisions quickly. AR can help traders view, analyse and manipulate large quantities of complex data faster through a more intuitive AR interface. Several companies have trialled Oculus Rift to create immersive 3D virtual reality environments for analysing data. Citibank has taken the next step by using Microsoft’s HoloLens headset to create Holographic Workstations for traders. These headsets use AR to layer complex data sets that enable traders to visualise and make decisions collaboratively with clients. We can expect to see more AR in bank offices in the future. With the rapid growth in mobile banking apps and introduction of digital-only banks, there are more and more questions about the future role of branches. Customers who aren’t able to visit a branch – or don’t want to – will eventually be able to have meetings with bank staff in the comfort of their own homes or offices. AR can enable realistic person-to-person interactions that will feel like both parties are in the same location. Not only is this experience better for the customer but, without the need to invest in physical branches, could also reduce costs for banks. It is possible to see how consumer spending behaviours have shifted as new technologies are applied to payments. The use of cash and physical cards has declined as digital payments have grown, both online via mobile apps (including wallets and Apple Pay), and through wearables like the Apple Watch (albeit this last category has grown more slowly than many would have expected). AR has the potential to drive the next wave of change. With the use of AR glasses, there is the possibility to further augment the way in which we shop. Similar to the ”home finder” apps, consumers could have real time product and pricing information overlaid onto their real world view as they browse items on the high street. They would be able to check their credit balance, view price comparisons, and even see offers appearing in front of their eyes as they walk through a shop or when they show particular interest in a product. Visa Europe is already experimenting with this, and has teamed up with the AR app Blippar, to transform retail experience. Their pilot, unveiled at a recent fashion show, enabled designer garments to be instantly purchased straight off the backs of models. If banks can build an experience which is not intrusive, there is a real opportunity to build a deeper relationship with the customer. What should banks be doing now? While many of these ideas may seem far away from hitting the mainstream, digital technology is moving so quickly it is critical to start preparing now. The reality that AR promises will become intertwined in our daily lives. Goldman Sachs has predicted that the augmented reality market will be worth $80bn by 2025. Banking institutions will have to keep up to attract and retain customers and employees. Of course, to make AR technology useful, institutions must have meaningful applications integrated with back office data and middle office decision management to create value for the customer. It is time to start that augmentation journey.